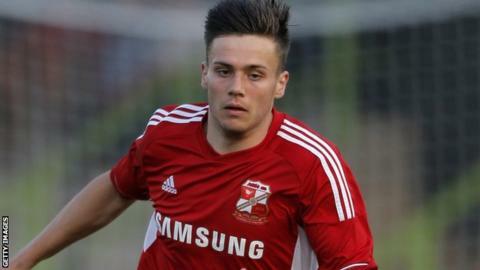 Northampton Town have pulled out of a deal to sign Swindon Town striker Miles Storey on loan. The Cobblers say they had verbally agreed for Storey to spend the rest of the season at Sixfields. But they claim they were asked to pay a weekly contribution higher than the striker's actual wage. Storey has now travelled north for talks with Scottish club St Mirren with a view to joining them for the remainder of the current campaign. "We will pay the wages of a player, but we aren't being lulled into paying a loan fee for a 21-year-old," Northampton manager Chris Wilder told the club's website. "We will do a deal if it is right for us, but we won't if not. "If Swindon want to pick up the phone and agree a deal to cover his wages that's fine, but we aren't sitting around waiting, we are moving on." Storey recently returned to Swindon from a loan spell at Portsmouth, where he scored three goals in 22 appearances. He previously spent time on loan at Salisbury and Shrewsbury, but his most high-profile appearance came when he scored both goals in Swindon's 3-2 League Cup defeat by Aston Villa in 2012.